10 Veracruz 5:45 ♠ Rolling Stock: El Tren Fantasma Step on board the ghost train and take a trip across Mexico from coast to coast Los Mochis to Veracruz. ♠ Rattle through a sonic landscape cross country Pacific to Atlantic on an acoustic journey through the heart of Mexico on board the most exciting, beautiful, and dynamic engineering project this country has ever seen. ♠ "Take the ghost train from Los Mochis to Veracruz and travel cross country, coast to coast, Pacific to Atlantic. Ride the rhythm of the rails on board the Ferrocarriles Nacionales de México (FNM) and the music of a journey that has now passed into history." ♠ El Tren Fantasma, (The Ghost Train), is Chris Watson's 4th solo album for Touch, and his first since Weather Report in 2003, which was named as one of the albums you should hear before you die in The Guardian. A Radio programme was broadcast on BBC Radio 4 on Saturday 30 Oct, 2010, produced by Sarah Blunt, and described as "a thrilling acoustic journey across the heart of Mexico from Pacific to Atlantic coast using archive recordings to recreate a rail passenger service which no longer exists. ♠ It’s now more than a decade since FNM operated its last continuous passenger service across country. Chris Watson spent a month on board the train with some of the last passengers to travel this route. As sound recordist he was part of the film crew working on a programme in the BBC TV series Great Railways Journeys. Now, in this album, the journey of the ‘ghost train’ is recreated, evoking memories of a recent past, capturing the atmosphere, rhythms and sounds of human life, wildlife and the journey itself along the tracks of one of Mexico’s greatest engineering projects. ♠ A stunning tapestry of field recordings from the master, Chris Watson, with his fourth album appearance on Touch, and his first since 2003's acclaimed Weather Report. Originally aired in a BBC Radio 4 broadcast last year, the sounds that constitute El Tren Fantasma (The Ghost Train) replicate the cross–country, coast to coast, Pacific to Atlantic FNM train route from Los Mochis to Veracruz. This line, a high watermark of Mexican engineering, no longer exists as a passenger route, but Watson beautifully recreates and evokes it using archive recordings. Watson spent a month on board the train with some of the last passengers to travel the route, when he was working as a sound recordist on the BBC TV series Great Railway Journeys. Watson fans will know what to expect: an aural adventure of great beauty, poignancy, humour and vivacity. ♠ Ride the Ghost Train from Los Mochis to Veracruz, and travel across country, coast to coast, from the Pacific to Atlantic, on an acoustic journey through the heart of Mexico on board one of the most exciting, beautiful and dynamic engineering projects the country has ever known, but which has now passed into history. 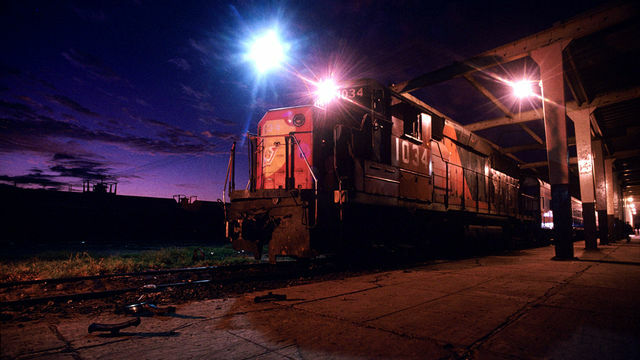 ♠ It's more than a decade since the Mexican State Railway System operated its last continuous passenger service across the country. Sound recordist Chris Watson spent a month on board the train with some of the last passengers to travel this route. In this sound portrait, based on his original recordings, we recreate the journey of the 'ghost train'; evoking memories of a recent past, capturing the atmosphere, rhythms and sounds of human life and wildlife along the tracks of one of Mexico's greatest engineering projects. ♠ Our journey begins on the west coast at Los Mochis. From here the track rises to an altitude of around 2,500 metres (over 8,000 ft) travelling through truly spectacular scenery as it sweeps through the Copper Canyon. The Tarahumara people, descendants of the Aztecs, still live a simple life in these canyons, as they have done for thousands of years. From here, we descend into Chihuahua City, and pause in the goods yard of the station, eavesdropping on an industrial symphony of metallic sounds. Further south, near the city of Durango, we swap railway coach for stage coach and travel to La Joya, the ranch once owned by the actor, John Wayne. Then it's back on the train, and onwards to the silver mines of Zacatecas. The dangers of working here are legendary. The ghost train travels on .. a gentle breeze sighs through the pine forest along the track side, and then, further south, the sounds of the Mariachi bands greet the train as it travels through Mexico city. In the vast landscape of shanty towns, the tracks are used as commuter routes by the locals. Cattle are even driven along them. But such practices can be fatal; in these suburbs, the trains don't stop. Then there's a diversion to El Tajin; here the descendants of the Mayans spin from tall poles and play games where the winner faces a sacrificial death. ♠ The end of the journey approaches; the ghost train thunders on towards the east coast, the Gulf of Mexico and our destination, Veracruz, where ship hooters in the harbour compete with the deafening screech of the train horn. ♠ The recordings used in this programme were originally made by Chris Watson whilst in Mexico with a film crew for the BBC Television programme, Great Railways Journeys: Mexico. Sadly, since these recordings were made, the artist Phil Kelly has died (August 2010).